Would you like to enjoy the benefits of a shade screen patio? Benefits such as cooler temperatures, no more glaring sun, fewer bugs and less dust. There are a couple of good ways I could suggest to convert your existing patio into one protected by shade screens. If you have an existing patio cover, aluminum extrusion can be made to form frames, connecting from awning post to awning post. Onto this frame shade screen frames can be installed. 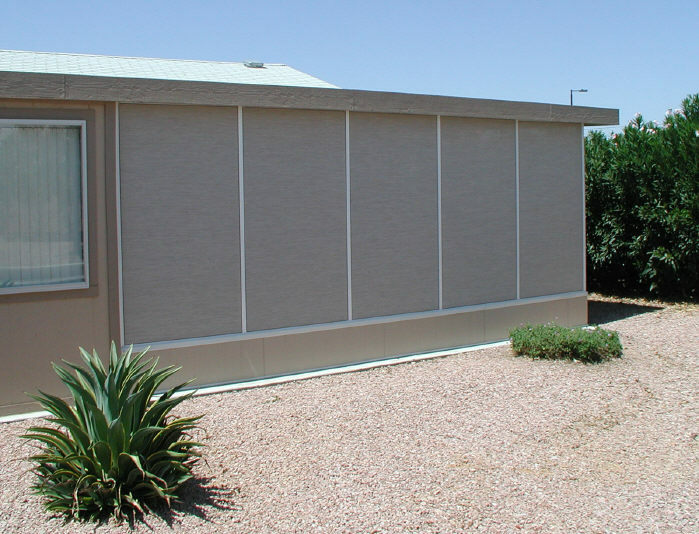 The shade screen material is available in several grades and colors. The stronger you build the aluminum framework the better they will withstand strong winds. The second way to have a shade screen room is to frame in a regular screen room, but instead of using bug screen, use shade screen. This room was done with a SunTex 80% in the Stucco color. The room was everything out customer wanted. They still had a great view of the mountains but the sun was kept out, as well as their neighbors eyes. 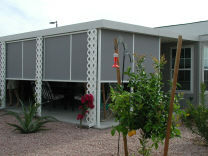 In the Mesa Arizona area let us help you with a screened in patio. There is still another way to have a shade screen patio, but only when you need it. This motorized screen system would be perfect for many different patio uses.